Electronic drive for Brushless motor with 12 pulses transformer integrated for harmonics contents reduction. Application: A380 THSA. Speed control, current and electrical power consumption limitation. Speed control, current and electrical power consumption limitation. Electronic drive for THSA Brushless motor. 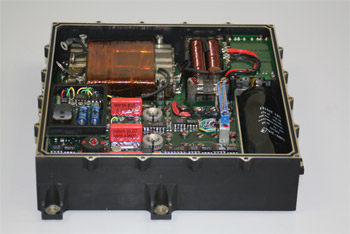 12 pulses transformer integrated for harmonics contents reduction.